Electrical Process Development Ltd (otherwise known as EPD Ltd) was established in Hawke’s Bay in 1994, as an Industrial Electrical Contracting firm, with a focus on the design, installation and development of Industrial Automation solutions to local Industry. Today, with new company Directors Glenn Kemp and Marshall Forman leading the business, EPD has retained its core focus and continues to provide specialist service and support to some of the regions high profile Food and Beverage companies, including Hawke's Bays largest Wineries and Orchards, as well as local Lamb, Beef and Hide processors. In addition to the Food and Beverage Industry, EPD has developed a strong background in Irrigation and Water projects, with a particular specialization in Telemetry and Resource monitoring. We are one of only a few HBRC recommended Telemetry solution providers in the region, capable of logging and transmitting data directly from certified electronic meters installed on your site, to the Regional Council, via our secure mobile network service. We are the only 100% Hawke's Bay owned and operated Telemetry service provider in the region. Outside of our usual core business, EPD also operates as an OEM, designing and fabricating our own "Vitura" brand of mobile wine transfer pump systems, using hygiene grade materials, coupled with automation and wireless control technology. 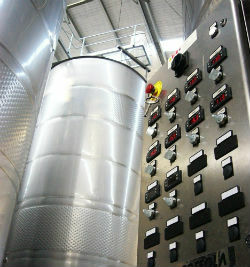 Our pumps can be seen in Wineries around New Zealand and Australia. As an Automation specialist, we are recognised by Omron New Zealand as a dedicated Omron Systems Integrator and have significant project experience involving the design and development of plant SCADA, PLC and field controls. In addition to Omron PLC, we have experience working with Allen Bradley, Modicon and Twido PLC. We are Service Agents for Danfoss Drives in Hawke's Bay, providing both field support for modifications to existing installations, as well as breakdown technical support. In addition to our field service support, we are able to offer a repair service for Danfoss Drives in our Hastings based workshop, using genuine Danfoss spare parts. As Industrial Electrical Contractors, the team at EPD incorporates a wide and varied collection of backgrounds, from pure Industrial Electrical servicing and maintenance, to Automation System Integration project work, as well as switch station operation and maintenance. This diversity in experience and skills allows us to cover almost any requirement within the Electrical Industry, involving Power Distribution and Control, Telemetry and Instrumentation, as well as Project Management. We are also able to facilitate mechanical services for any electrical project we are involved in, via our local partners, providing further value add to our clients. Our customers operate in a wide range of Industrial and Commercial sectors, each with their own unique requirements and demands. End User Manufacturers, Food and Beverage processors, Irrigation and Engineering firms employ EPD to provide services and equipment necessary to the ongoing improvement and success of their operations. EPD's focus is squarely on our clients, both large and small, through personal service and with a view to provide long term technical support. We aim to build strong relationships with our clients and many of our clients are now friends. If there is a requirement on your site, we can provide the support and service you need to maintain your business.